Registration: Sorry, public registration for this event has been closed! Rub elbows with 50-100 of your fellow Cape Codders at After Hours Connect -- a monthly networking event with appetizers, cash bar, and raffle prizes. All are welcome! 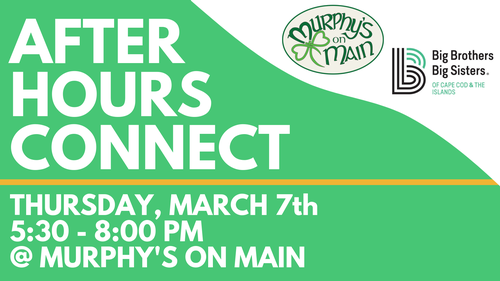 Our March After Hours will be hosted by Murphy's on Main on Thursday, March 7th from 5:30-8:00 PM. CCYP is also excited to welcome Big Brothers Big Sisters of Cape Cod and the Islands for their "30 Guys in 30 Days" initiative.